Home / Behind Enemy Lines / Duke Machado / Gene Berardelli / ICYMI / Russell Gallo / The VIto and Vito Show / Watson Prunier / ICYMI - #CNNDebate Snap Reaction! 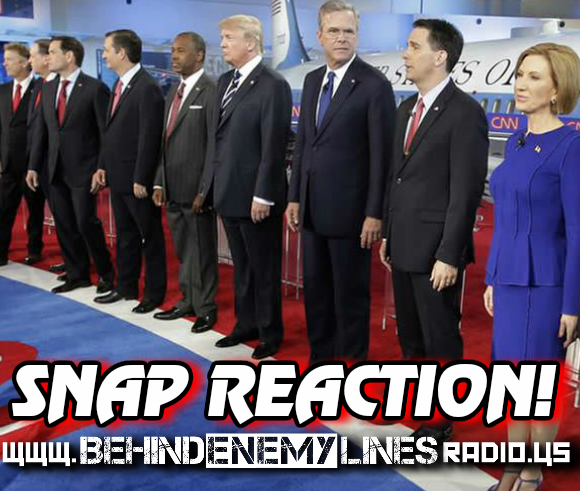 ICYMI - #CNNDebate Snap Reaction! Taped immediately after the #CNNDebate, Behind Enemy Lines gives you our snap reaction to what we heard on stage from the 2016 Republican candidates for President in California. Gene & Russ are joined by a myriad of We Are America Radio hosts, including Vito & Vito, Watson Prunier and Duke Machado, as well as getting some insight from those who attended the Brooklyn Young Republicans debate watch party at Cafe On The Hill in Brooklyn, NY. Who won? Who lost? Who didn't do enough? Relive the awesome and the awkward, and debate who you think came out on top!